All Xtreme Post screw piles are produced according to the highest quality standards at our plant in Danville, Québec. Recognized by the Canadian Construction Materials Centre and in keeping with the spirit of the National Building Code, Xtreme Post piles offer an accessible and safe solution for all your foundation needs. Depending on the nature of your project, the screw pile head will be fixed or adjustable. One of our experts will advise you which is the best choice for your needs. This long screw — a central shaft with a circular steel thread welded to the bottom — can be adapted to any type of construction or renovation. The central steel shaft can vary in diameter and length, the shortest measuring seven feet long. One of our installation specialists will determine which screw pile is best for your project. The threads are angled to create the desired pitch, which is carefully controlled with hydraulic equipment. These threads are the basis of the screw pile system and are commonly referred to as “blades.” The diameter and number of blades is determined based on the bearing capacity of the soil (compactness and type) and the load to be supported. Can shift due to ground motion and frost. Excavation required to pour concrete. Heavy machinery on grass and asphalt. Time spent waiting for the concrete to harden. Must be built before the rest of the project. Fast — construction can start as soon as the screw piles are in place. 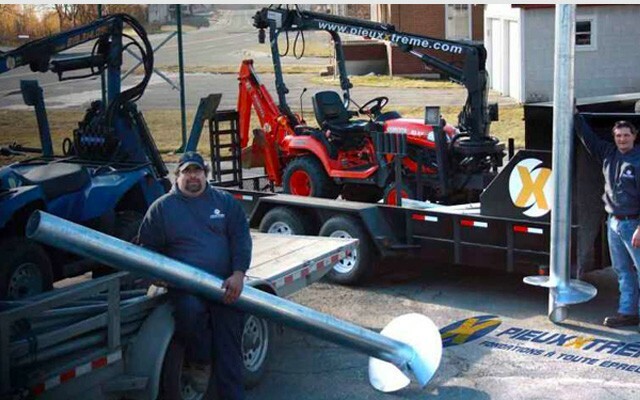 Every Xtreme Post screw pile is installed by a highly trained professional. Quick turnaround times that respect your schedule. Excellent value in terms of quality and price. Each pile’s load-bearing capacity is confirmed upon installation. Can be installed on any terrain (uneven, difficult to access, etc.) and in any soil type (sand, clay, rock, etc.). Screw piles can be relocated as needed. Screw piles can be installed below the water level, through the water table. Ecologically sound: screw piles can be installed near water with no risk of soil erosion or water contamination. Our technique is environmentally friendly. Every screw pile is constructed at the company’s head office, in Québec. You deal directly with the manufacturer. The quality control and expertise developed over the years at Xtreme Post have allowed us to build our own machinery. The smaller size and multipurpose capability of our equipment make it possible for us to access locations that are hard to get to with traditional equipment. All Xtreme Post screw piles are produced according to the highest quality standards at our plant in Danville, Québec. Our staff is trained to deliver products that meet the high standards of quality that our loyal customers are accustomed to. In fact, Xtreme Post has received approvals from the Canadian Construction Materials Centre (CCMC 13353-R) and complies with the requirements of Québec’s Building Act, including the Construction Code and Safety Code, and Ontario’s Building Code Act and related rulings. In accordance with the standards and quality requirements to which Xtreme Post is committed, the load-bearing capacity (compression, tension) of every screw pile is confirmed by one of our experts upon installation. What’s more, where needed, an engineer will issue a certificate of conformity regarding the work to be done. All of the product’s steel components (central shaft, blades and accessories) conform to CAN/CSA-G40.21-04, « Structural Quality Steel », and also have a coating of 610 g/m3, which protects them against galvanic corrosion and meets the requirements of CAN/CSA-G164-M92, « Hot Dip Galvanizing of Irregularly Shaped Articles ». The Canada Mortgage and Housing Corporation (CMHC) permits the use of this product in construction financed or insured under the National Housing Act. For more information, see Evaluation Report CCMC 13353-R on the Xtreme Posts (Pieux Xtrême) screw pile.